A few years ago, a dear girlfriend of mine made me oh-so giddy when she hired me to do her makeup for both her engagement photos and wedding day. Seriously, it was such an honor! 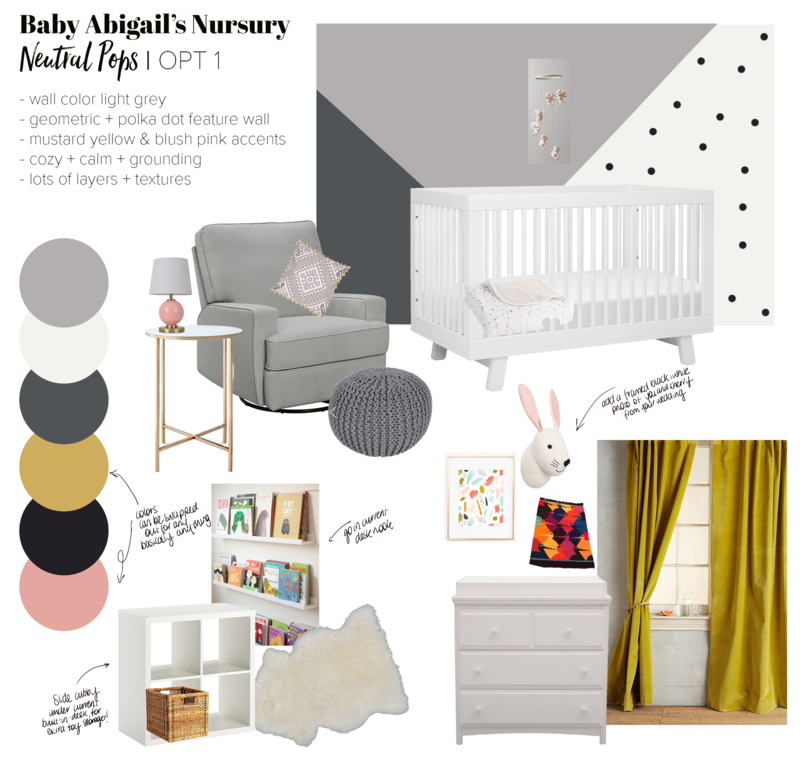 So when the same friends and now first time parents-to-be, Ashley and Kherry Zamore from Houston, hired me to design and style a “not too kiddy, budget friendly, modern, comfortable, calming, somewhat gender neutral-ish” nursery for the impending arrival of their sweet baby girl – my heart burst again. 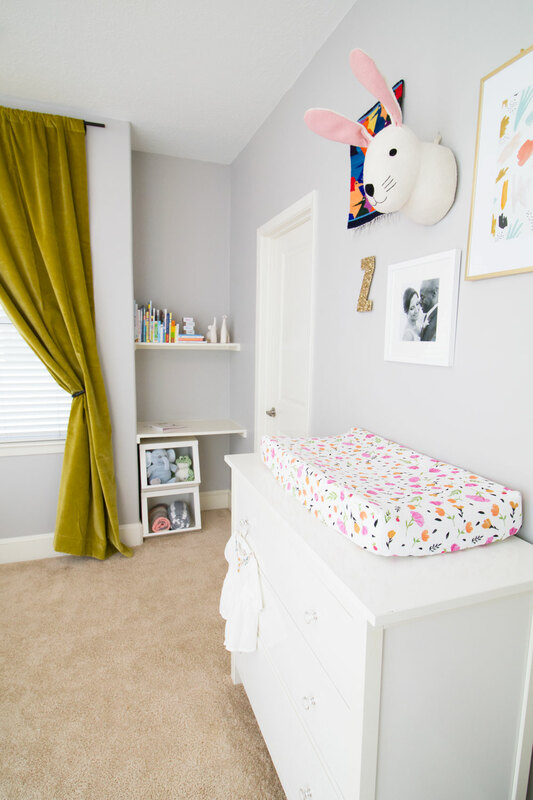 How were you feeling about the thought of transforming/making over your guest room to a nursery, before you hired Shelley? We were feeling pretty overwhelmed and indecisive. We were clueless where to start – we had a lot of options and a blank slate..and the minute details kept making us go in a million directions! Why did you decide to hire Shelley instead of someone else? Besides being a dear friend, she has impecable taste – we loved what she did with her house in Baton Rouge. 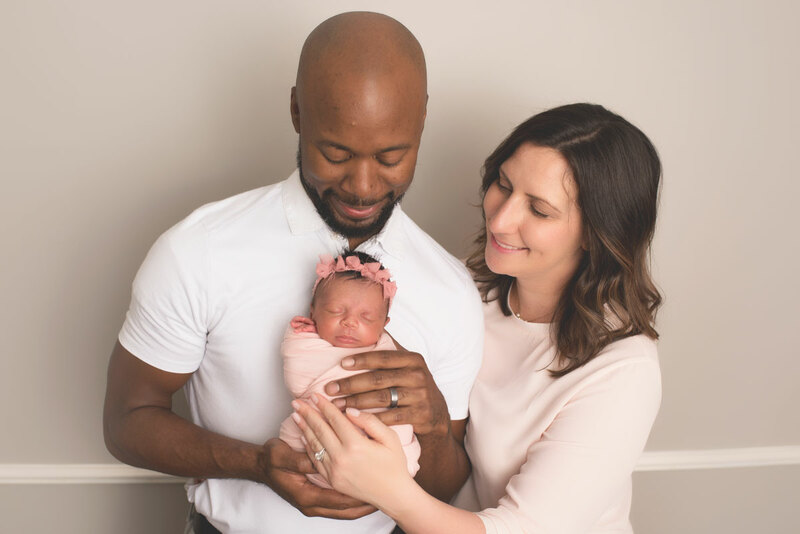 And she is truly a professional that polishes – we knew without a doubt that we would have a polished room in time for baby Abigail. Lol, just like an HGTV makeover episode, we knew her personality would make it that much more awesome! What did you love about working with Shelley? Shelley guided us through every step – from budget and color preferences, to stepping out of our comfort zone with big decisions. 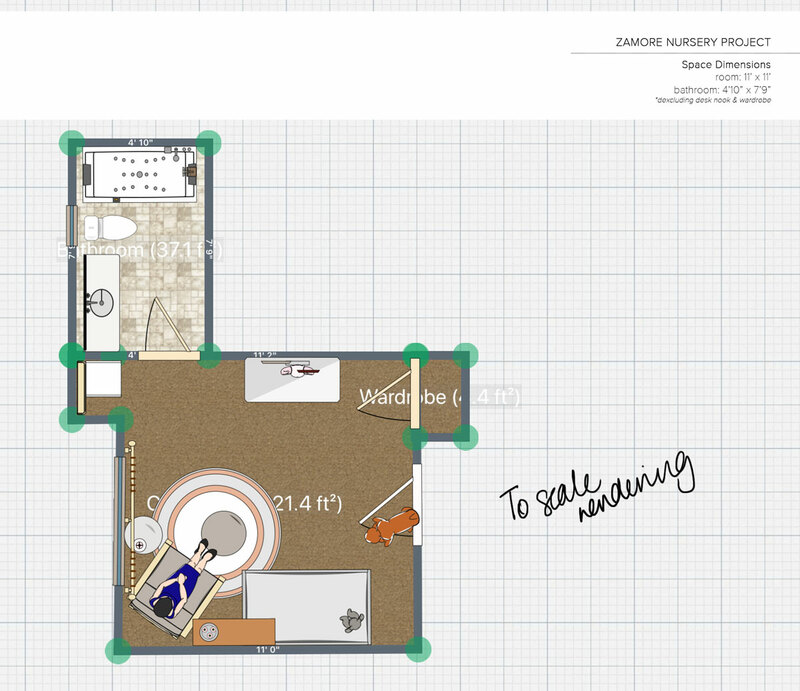 She also provided us a 3D rendering of the room, which totally eased our minds about how everything was going to look…and fit…before we even got started. 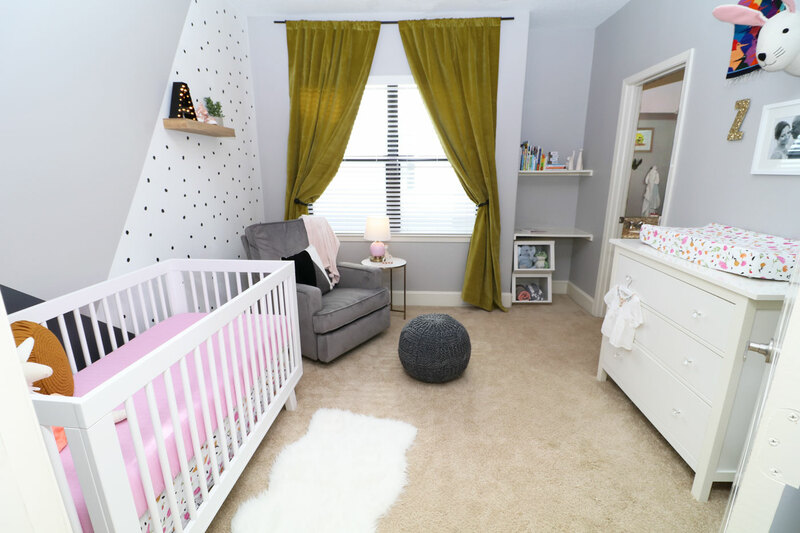 We now have a nursery for our gorgeous baby that makes us feel relaxed, serene, proud and excited! Thank you from the bottom of our hearts!! Today I’m beyond excited to finally share the totally crush-worthy, Zamore Nursery Project! 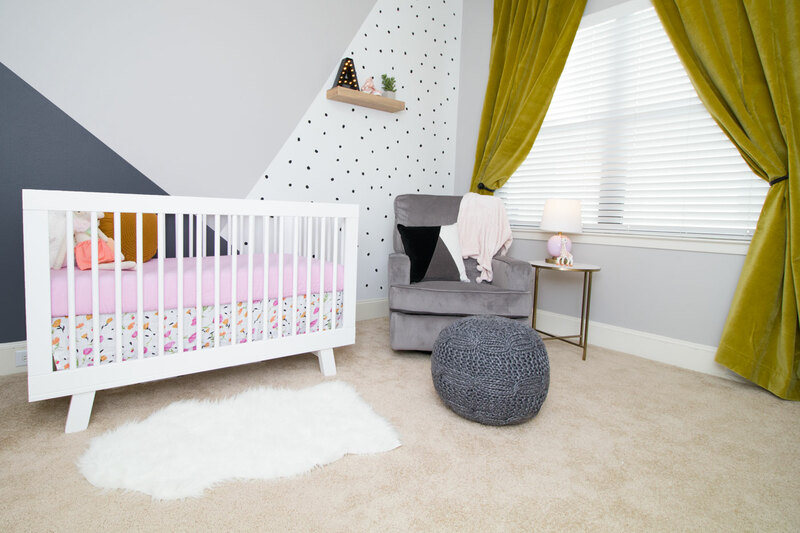 I’m obsessed with how the Zamore’s space turned out – from the accent wall I painted, to the color palette, and all the little details in between. 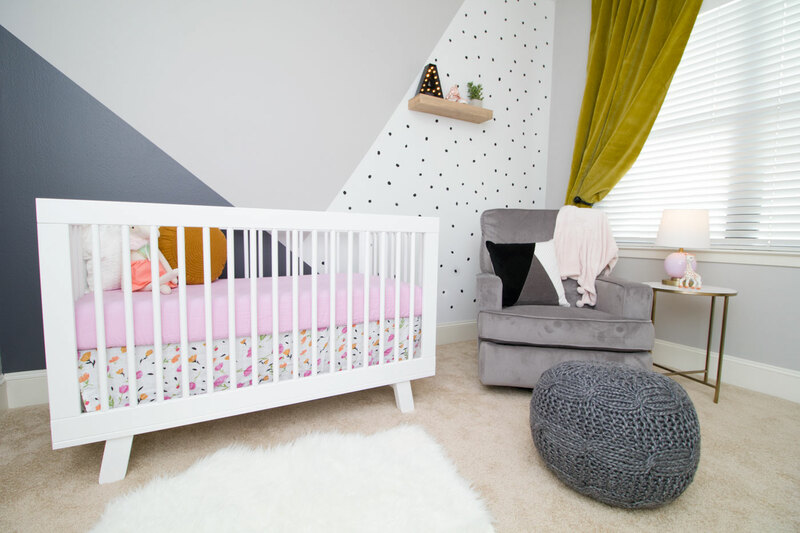 Here is how I transformed the Zamore’s guest room into a dreamy nursery for mum, dad, and baby. 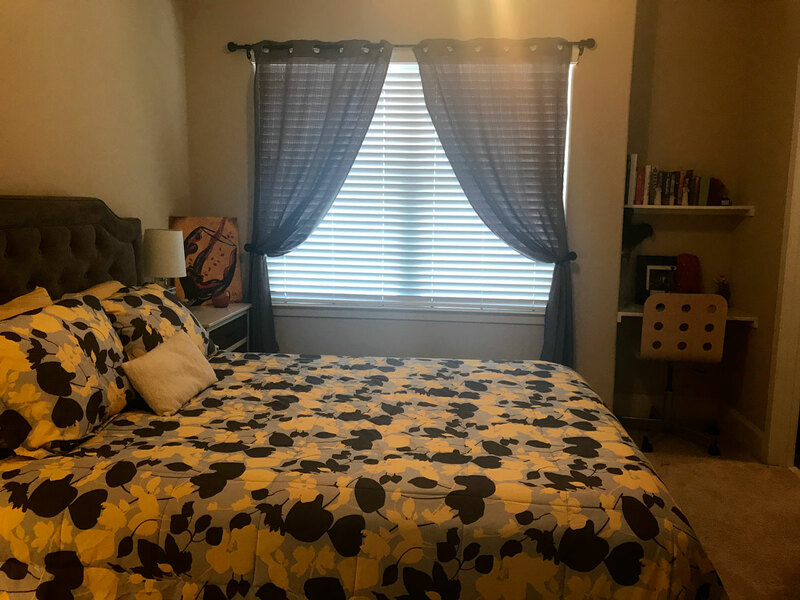 The space was previously a comfortable guest room sporting traditional builder beige walls, dark brown stained wood bathroom cabinet, and an eclectic arrangement of decor. 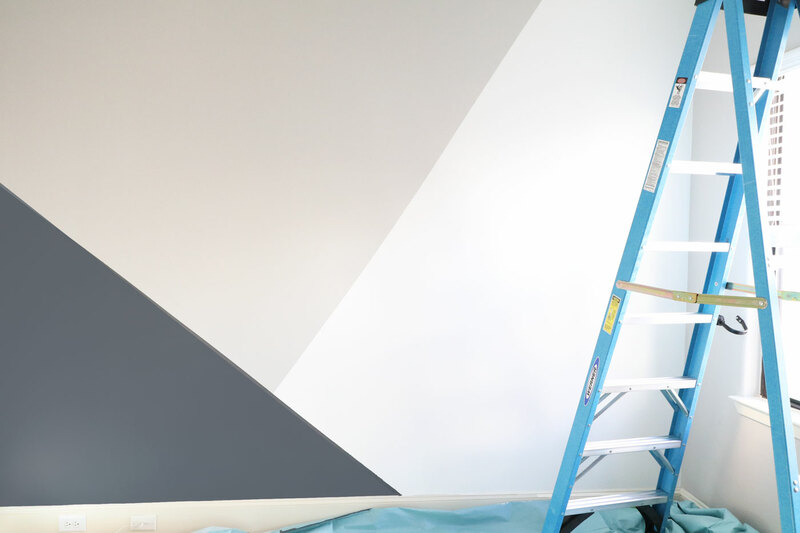 To keep costs down, we decided to paint an accent wall rather than hang wallpaper or install any other type of material. 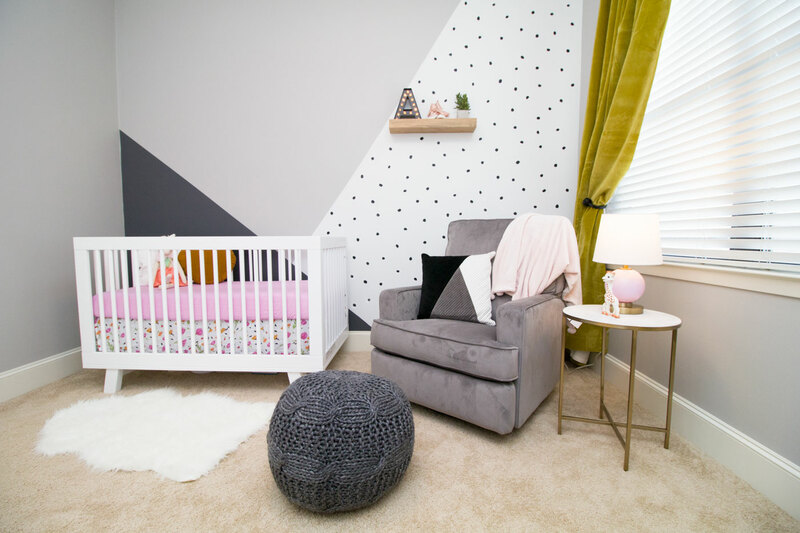 The irregular polka-dots were simply decals from Urban Walls that could easily be removed at a later date. A quick tip for those of you with littles: a satin finish paint is much easier to clean than a standard matte/flat paint finish. 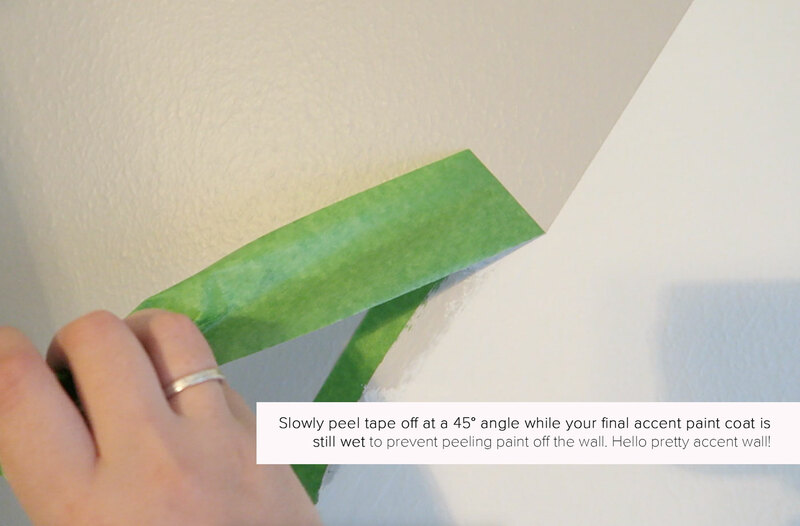 It’s also more resilient to scuffs. It was important that this room grow with baby Zamore. And should my clients decide to sell, we wanted to make sure this room could easily be pair down to appeal to many. 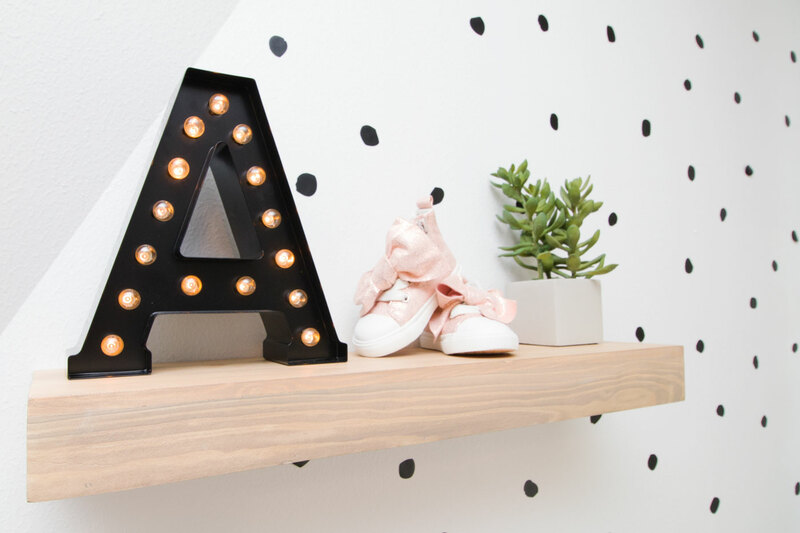 For that reason I decided that decals would be best for the polka dots – I found these irregular dots from Urban Walls. I love that they looked hand painted and not so perfect! On another note, how cute are these pink sparkly high-top sneakers?! (a gift for my lovely clients babe when she is bigger) If only they came in my size! Unfortunately our first choice of lamp wasn’t available – it was the same style with a blush base instead of the pictured lavender one. Initially I was super disappointed because there was nothing similar within the clients budget that I could find to replicate the look. 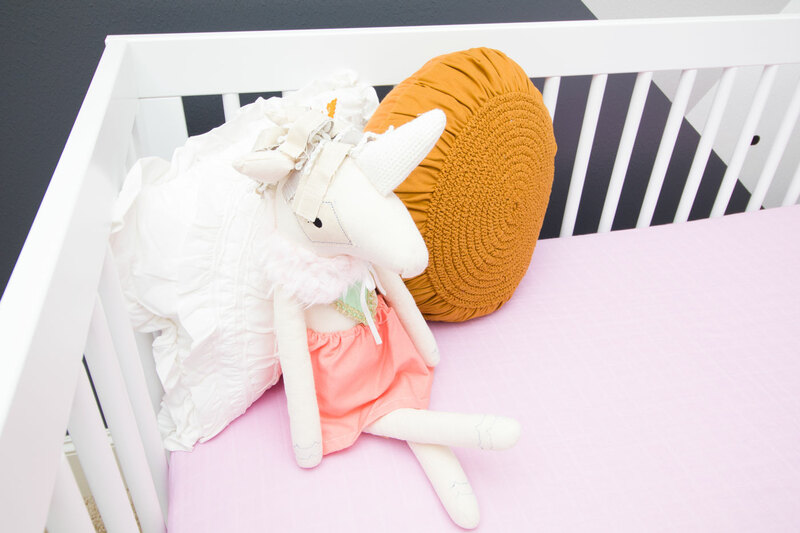 But when I found these gorgeous crib sheets, skirt and changing pad cover…I just knew it was a match made in heaven! Originally I thought I’d repaint this once brown stained cabinet, white. 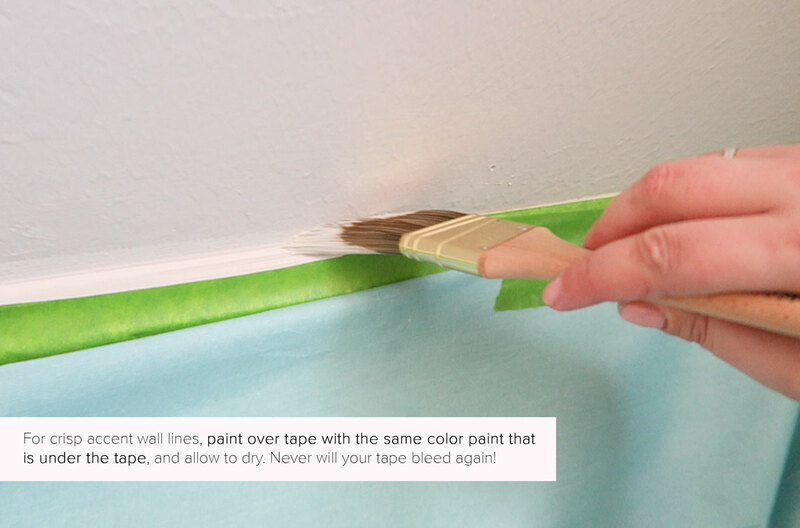 Then I decided on the fly that it would look much better as the deep Sherwin Williams Peppercorn color, from the accent wall…and I wasn’t wrong. 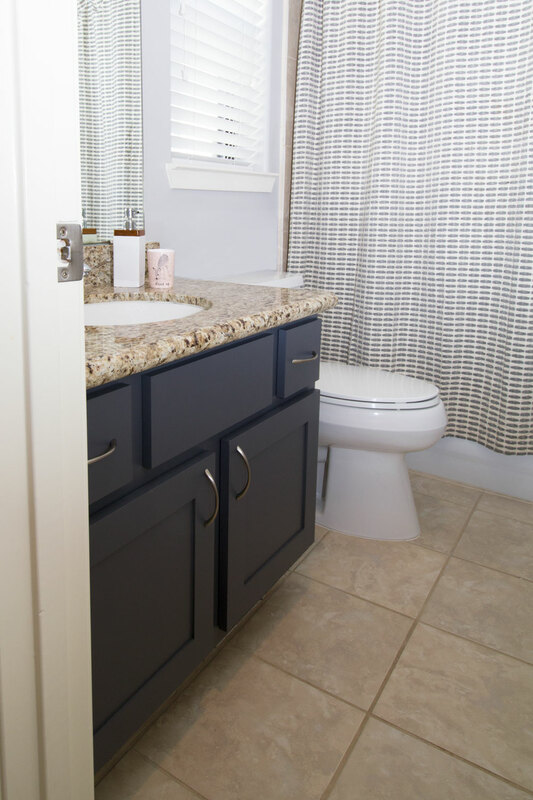 I love the character this bought to the bathroom – the color really pulled the grey tones out of the bathroom tile and tied the original shower curtain in beautifully. I’m always making changes on the fly to get that perfect finish for my clients! Repeating colors, textures, and/or themes is a great way to ensure continuity through your design. In every one of my projects, I like to surprise my clients with a little something personal or meaningful to their situation. I had just the thing for the Zamore Nursery – a black and white print of Ashley & Kherry’s wedding day. Littles love to see pictures of there family…and there is just something so special about mum and dad’s wedding photo. 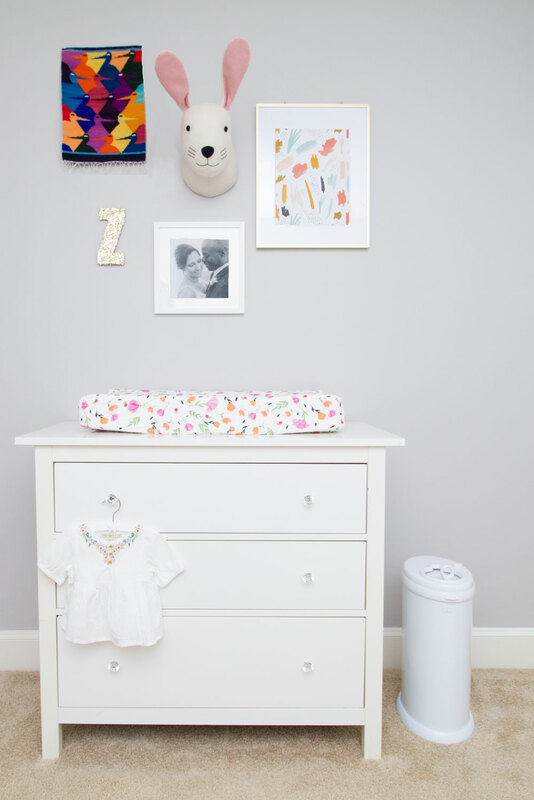 Want to incorporate some photos into your room design – maybe a gallery wall – but the colors of your favorite photos, clash with your color palette? No problem, love. Simply print your photos in black and white! It always looks so chic! 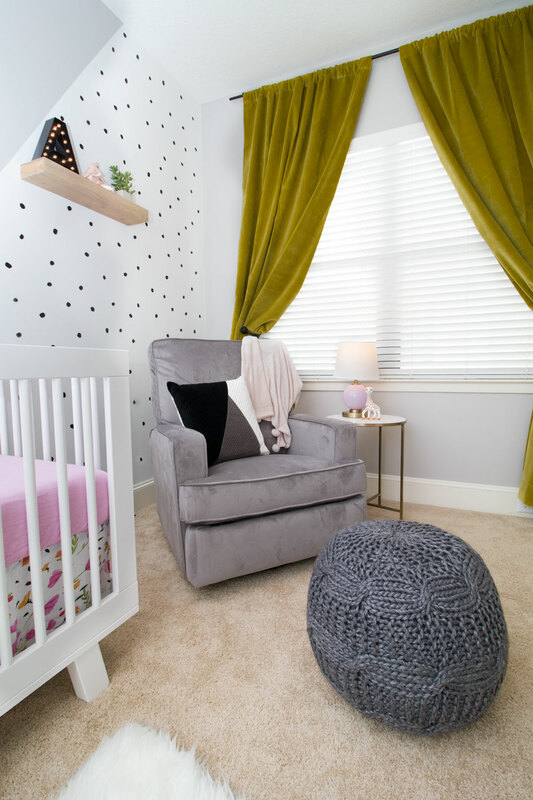 Finally, the chartreuse, matte velvet drapes brought so much warmth and coziness to the Zamore Nursery, while pulling the green/mustard tones together from the gallery wall art piece, crib skirt and changing pad cover. We hung these curtains as high as possible to make the ceiling height look taller…and ensured the hem brushed the carpet. 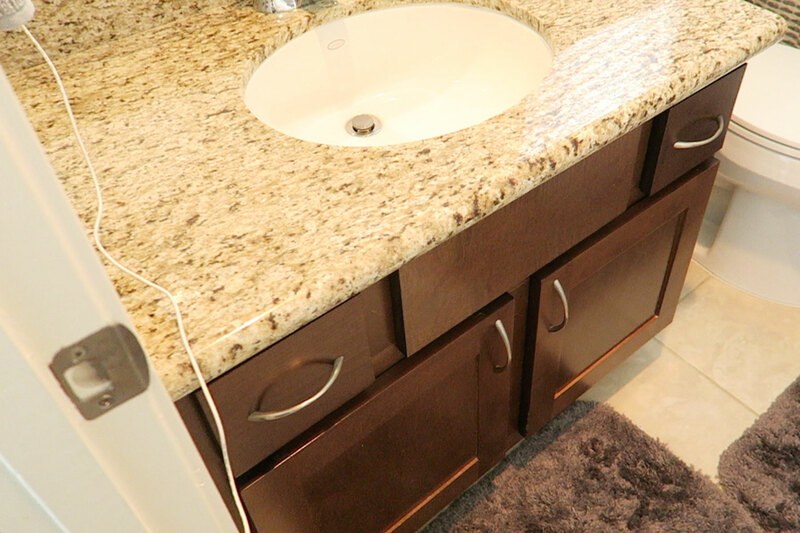 Check out the below before and after…crazy how much more space it feels like there is, right?! Does your space need some sparkle? 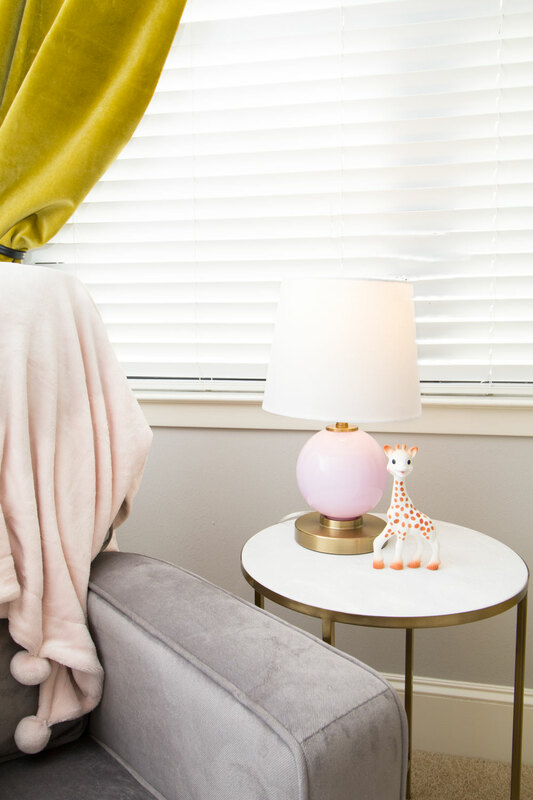 If you have a space – home office, studio, or maybe a commercial space that you’d like me to wave my glitter-wand over, check out my new interior design service, 911 Style My Space or email me at shelley@fromshelleywithlove.com with your questions. Love love love! Shelley, this is out-of-the-park amazing (but I wouldn’t expect anything less )! 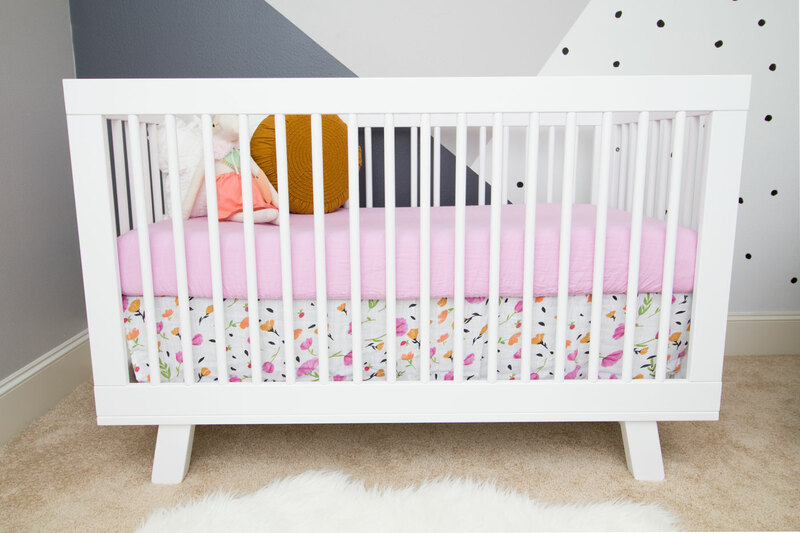 Congrats to your clients on their updated room and sweet baby girl! 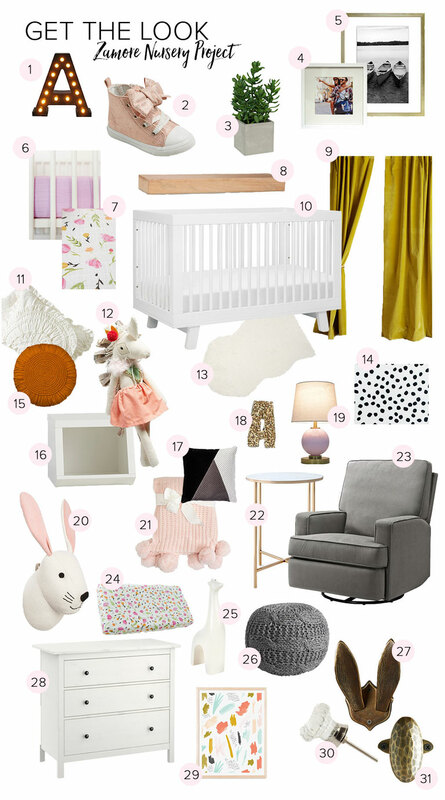 Love this nursery!!! Getting some major inspiration with that accent wall!! 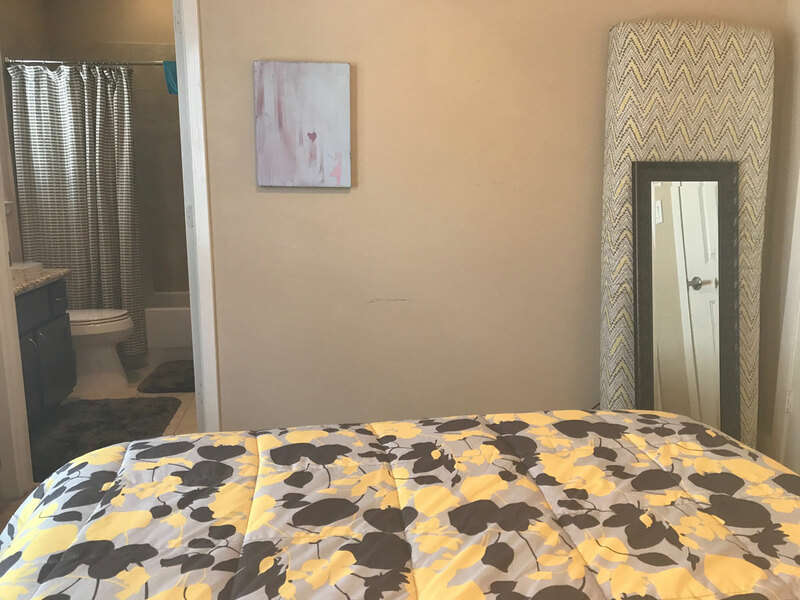 Is the entire room painted that Knitting Needles gray from the accent wall? Thank you Shelley!! One more question, the pure white was used for the ceiling and the accent wall?? 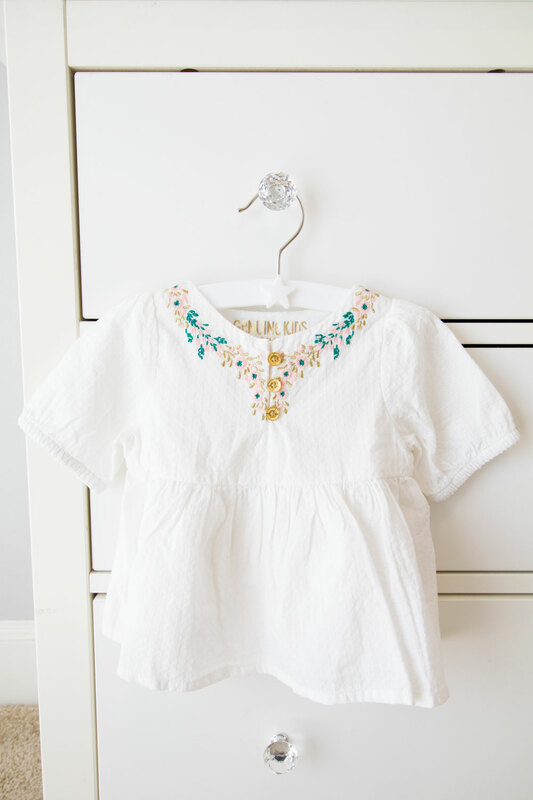 We love this color combo so much that we are going to replicate it! I appreciate that you shared the colors! !